One of the largest and most impressive antique mourning/sentimental locket front brooches we have ever had the pleasure to offer. Crafted in solid 9ct gold, including the pin back and clasp the brooch features ornate gold repousse work against a jet black enamel background. The center of the brooch holds a gold framed raised glass compartment containing pale blond plaited hair, in memory of a beloved person long departed. 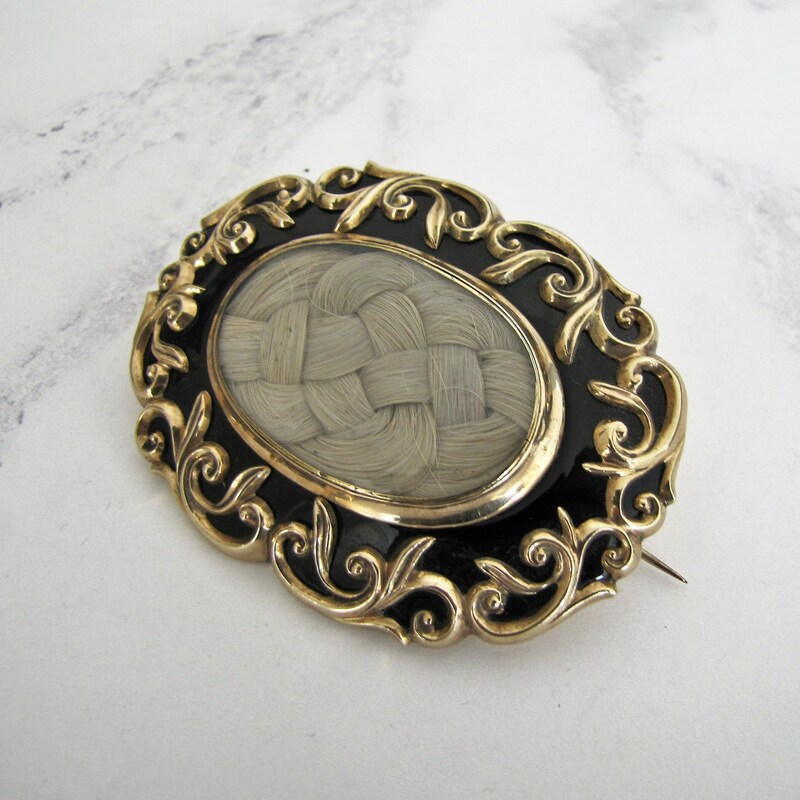 Dating to the early to mid Victorian gothic revival era the brooch has a solid gold back polished to a mirror finish with a very sturdy long pin stem, t-hinge and c-clasp. There is also room behind the curved pin stem to thread a chain or ribbon for wear as a large pendant should you wish to. Despite considerable age it is in the incredible condition that we can expect to see in fine jewelry of a particularly high quality - it could have been made yesterday! A superb example of desirable English antique mourning jewellery of the 'grand period" and highly collectible! MEASUREMENTS: 2-3/4 inches wide by 1-3/4 inches high (approx. 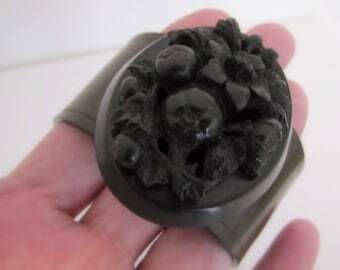 70x38mm) The hair compartment measures 38x26mm. HALLMARKS: None, acid and electronically tests as 9ct gold throughout. CONDITION: Excellent, no discoloration or wear to the gold, any dark marks are camera shadow. The enamel work is in tact with no visible loss. The pin back and hinge in perfect working order. The hairwork is still well pillowed with no sign of breakage or deterioration. There is a tiny hairline crack to the glass visible only under magnification and the ring that would have held the safety chain has been snipped off, tiny imperfections that have been mentioned for accuracy rather than anything that will affect the integrity or desirability of the piece. Georgian Mourning Brooch, 9ct Gold, Black Enamel, Locket Front Hair Panel. Antique Miniature Lozenge Brooch. Fine 9K Gold Tie, Cravat Pin.